It's one week of the year that we dedicate to all things spooky, and I can't think of a better time to host a giveaway of this classic story! For those of you who don't know, Penguin Classics has recently released The Legend of Sleepy Hollow and Other Stories. 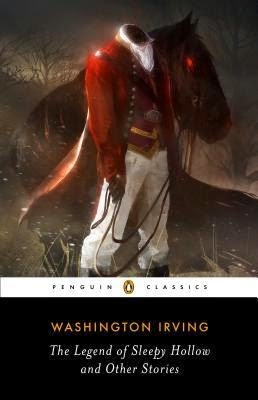 It's a new package for Washington Irving's classic stories, with an added introduction and notes by Elizabeth L. Bradley. The setting of “The Legend of Sleepy Hollow” is renowned for the supernaturalism that pervades the imaginations of its inhabitants and visitors. The most infamous specter in the Hollow is the Headless Horseman, said to be the ghost of a Hessian trooper who had his head shot off by a stray cannonball during the American Revolutionary War, and who “rides forth to the scene of battle in nightly quest of his head.” The “Legend” relates the tale of Ichabod Crane, a superstitious schoolmaster from Connecticut, who competes with townsman Abraham Van Brunt for the hand of 18-year-old Katrina Van Tassel, the daughter and sole child of a wealthy farmer, Baltus Van Tassel. Crane sees marriage to Katrina as a means of procuring Van Tassel’s extravagant wealth. Bones, the local hero, vies with Ichabod for Katrina's hand, playing a series of pranks on the jittery schoolmaster, and the fate of Sleepy Hollow's fortune weighs in the balance for some time. The tension among the three is soon brought to a head. ELIZABETH L. BRADLEY, the author of I, serves as literary consultant to Historic Hudson Valley, the caretakers of Sunnyside—Irving’s Tarrytown, New York, home. She also wrote the introduction and notes for the Penguin Classics edition of Irving’s A History of New York. Please enjoy the book trailer that Penguin has so kindly sent along, and scroll down to the bottom for the giveaway! One lucky winner will take home a copy of The Legend of Sleepy Hollow and Other Stories. U.S. and Canada only please. Good luck!